Grafted Korean Giant and Shinsui onto my Hosui yesterday. 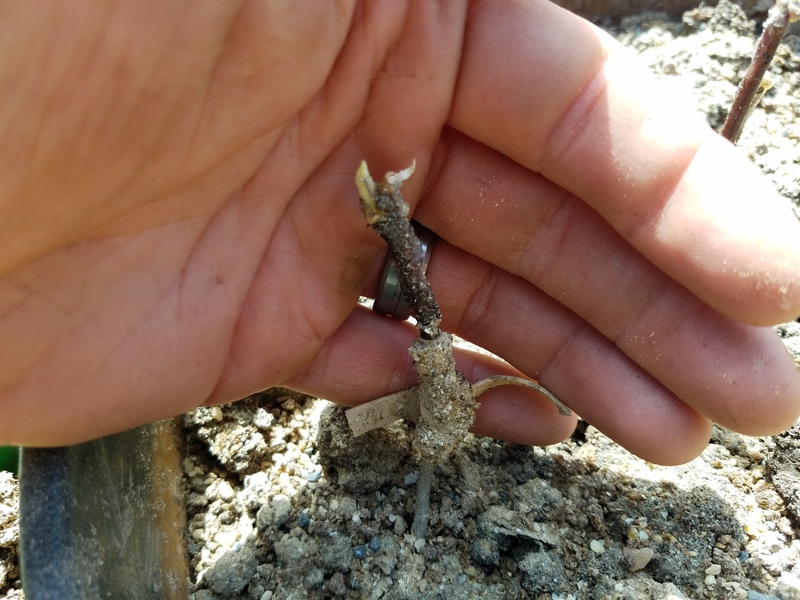 First time ever grafting so it was a bit intimidating and I felt like I didn’t really know what I was doing even though I watched a ton of YouTube videos (thank you @Jsacadura and @SkillCult) and read many grafting posts. I feel like I got pretty good cambium contact but If I get even one take I will be very happy. Hardest part for me was choosing WHERE to place the grafts. I think they are well enough into the body of the tree it looks like. One of the biggest mistakes I made early on in frameworking was putting scions too far to the outside of the tree. More or less, if thinking of structural wood v.s. fruiting wood, keep your structural wood and replace the fruiting wood, which is more of less what you did here, but on a larger tree it would look a little different. If those were different varieties from each other, I might want to see them spaced further, since as the tree grows out those branches may end up being thinned out at some point. I bet you’ll do fine. Grafting is more accessible than most people think. I find the biggest obstacle for most people, assuming they have good information is just the ability to execute the cuts well since knife use isn’t a very common skill in modern times. It will be great to have that variety on the tree in the future. It’s my sincere hope that someday it will be almost a default to think of a fruit tree as an opportunity to grow more than one variety, rather than assuming one tree, one variety. “A chicken in every yard and a frankentree next to every garage.” Sherbert Hoosier. “A chicken in every yard and a frankentree next to every garage.” Sherbert Hoosier. 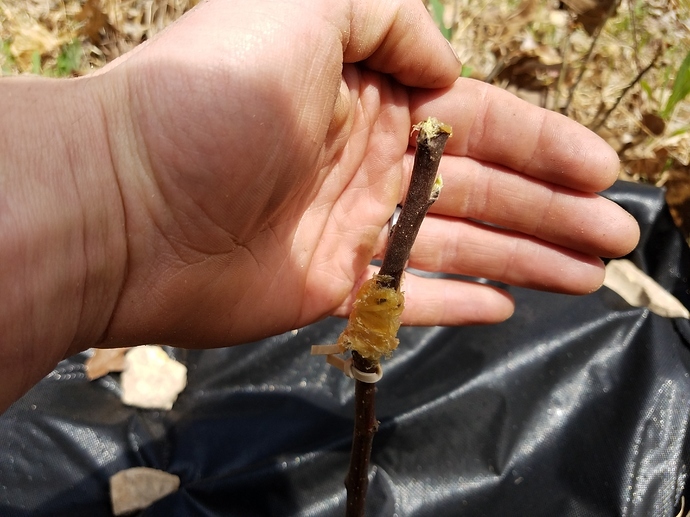 This tree has already been pruned heavily and I tried to place the grafts in locations where they have potential for 2-3 feet of additional growth. I would have wanted to re-work entire structural “sections” to a different variety but - not having many fruit trees - I didn’t want to lose branches that already had blossoms this year. The grafts in that photo were all of the same variety, I’m not sure why I decided to tag each branch I grafted as I will probably able to tell the difference in the fruit in future. I tried to cluster the same varieties together as best as I could. I was able to graft Purple Heart and Shiro plum onto my Methley. Also got Chestnut Crab onto GoldRush. I hope to take off Wednesday and get the rest of my grafting done. My husband and i have been watching all of your grafting videos as well, and he did a bark graft on a pear over the weekend. He is a chef so he has the knife skills. And now the graft skills. Thanks. Does anyone have a recommendation on a knife stone/sharpener? Are they all basically the same or is there anything in particular i should look for when buying one? They are definitely not all the same. I really like a stone by King, the 1000 grit on one side and 250 or 240 on the other. You can sometimes find it for under 20.00 It cuts fast and the 1000 side is fine enough that you can finish up on a leather strop with some polishing compound. I do have a video on youtube that demonstrates sharpening, that you probably saw, it’s #5 in the 10 part grafting series. There should be a link to that stone in the video description. Bonus is also that it’s long enough to cut a square off one end to sharpen axes and machetes and stuff like that, and still have a 6 inch stone for sharpening knives and other stuff. You may need to flatten it once in a while by grinding on a flat slab or brick and they are very soft, but that’s why the sharpen tools so fast. Strop can just be a piece of old leather belt or a leather boot tongue glued to a small board and rub just about any type of polishing compound on it. Stropping occasionally can get you by for a little while before needing a full resharpen. Sounds good. Best to think into the future as far as growth is concerned and sounds like you did. Looks like a lot of posters here that seem to know their stuff, so I have a grafting question. Is it possible to graft citrus such as blood orange, clementine, or lemon to a loquat tree and have them take? Nice grafts. 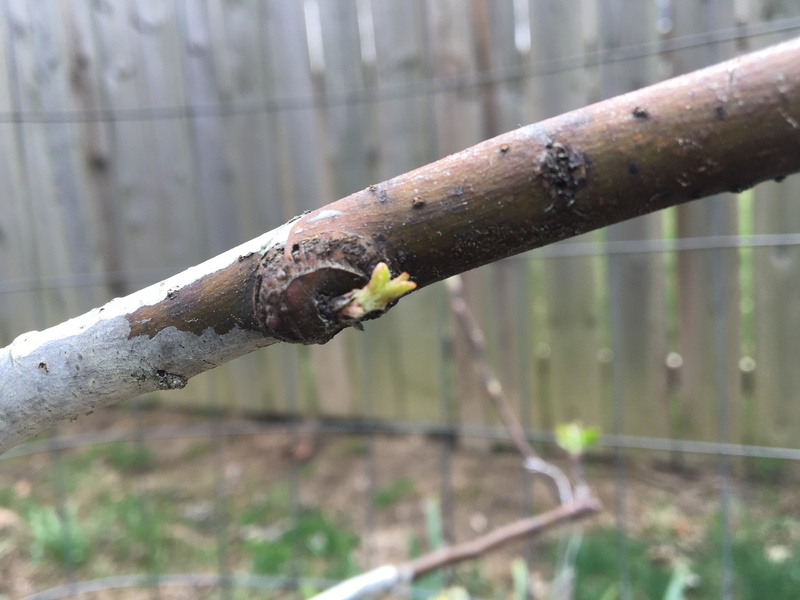 If you left some branches without grafts, be sure to control their vigor, if needed, by pinching the tips to stop their growth rate for instance and allow the grafts time to catch up. 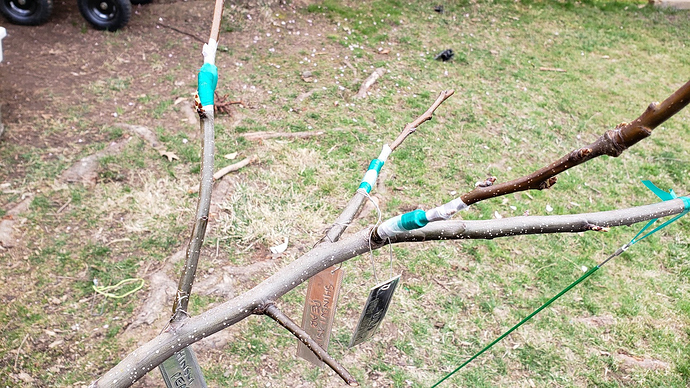 I also have several trees of different fruit types with several different varieties grafted. If possible, its best to choose similar vigor varieties so, the job of pruning each one, isn’t more complicated than usual (i will post a video soon about some of the challenges with these franken trees). 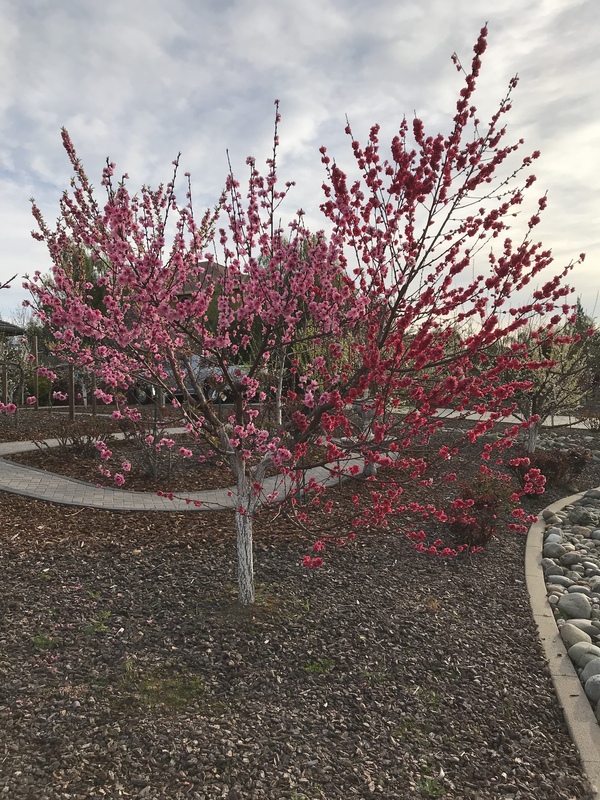 Also, if anyone has a tree in a yard and is worried about it being aesthetically pleasing, beware that grafting different varieties that may bloom and start leafing at different times, can produce some very awkward looking trees for a few weeks, in the spring. They can look awkward but they can also look nice! Looks a lot better in the sunshine but we have had a huge winter here, not much sunshine until this week, and the blooms are done already. This was my first year grafting anything and it went great! Out of the 29 non-avocados I bench grafted, 3 were my late-season grafts and I just grafted them a few days ago, 3 failed, and the other 23 are thriving! The three failures were all very thin scions I got for free from an exchange, and one was actually grafted for me by an expert, so I think they just may have dried out too much before I acquired them. This was a very good learning experience. I tried a lot of different things, mainly sourced from here (thanks all!) and YouTube. I did a mix of whip grafts (couldn’t get the tongue figured out), cleft grafts (for the other thin scions), and used my cheapo omega tool. I wanted to see which method worked best for me but they all worked really well, so that was a bust. I have a lot more trees growing than I expected to, but I guess that’s a good problem to have. I’m not sure what my avocados are doing as they’re all still green but don’t seem to have grown at all, but I’m optimistic. I traded some pear and plum scions for apple this week. It was not a close acquaintance but he did grafting and used to do some work with an apple hybridizer. Long story short, after we exchanged them in the Safeway parking lot ( I thought we looked like two drug dealers swapping packages and then each jumping into their respective cars and buggering off ) I got them home and realized that none of them were labeled! While I am very grateful for them I have no idea what they are, one of them is supposed to be Celestia, an apple I was pleased to get a hold of. I was planning to give it a place of pride but now I have to find 20 spots to graft these as if I miss even one I might miss Celestia. Well, I won’t look a gift horse in the mouth, but I remember an older man at a grafting sale drumming into people’s heads “YOU MUST LABEL THE SCION”. For sure, I didn’t really ask for any, just whatever he cared to give. But I think this might be a blessing in disguise, I won’t be stressing over any of them if they don’t make it, what I didn’t know I had I won’t miss. And each fruit will be a present to unwrap. That’s a good way to look at it. And you might graft them on B-9 or M-9 or G41 and find out sooner than later if you like them? Also you could plant them 5 feet apart that way? Here is a chip bud I did a couple of years ago on my fuji Apple. It took but never grew. I decided not to force it since I kind of thought it’s in a wrong spot. This year it decided to grow. This is my first year grafting. It is incredibly exciting to see some buds swelling on my first few batches of grafts. 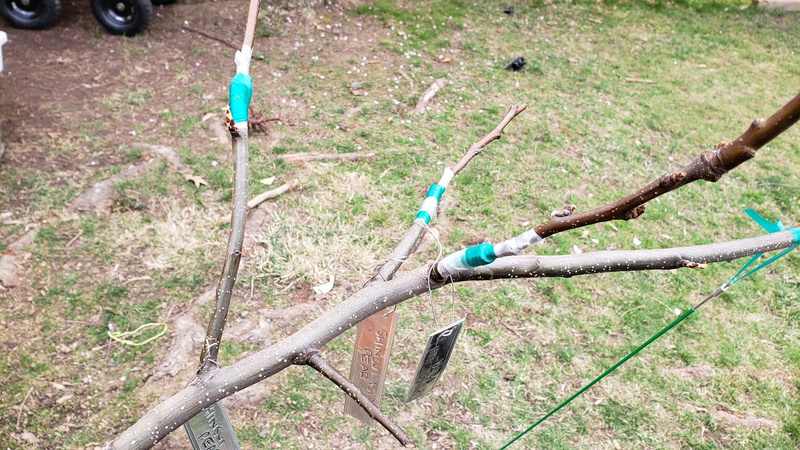 I’m especially excited that Knobbed Russet and Hooples A.G. are showing signs of life. I’m also pretty happy that some toothpick sized scions of Cox’s O.P. appear to have taken.